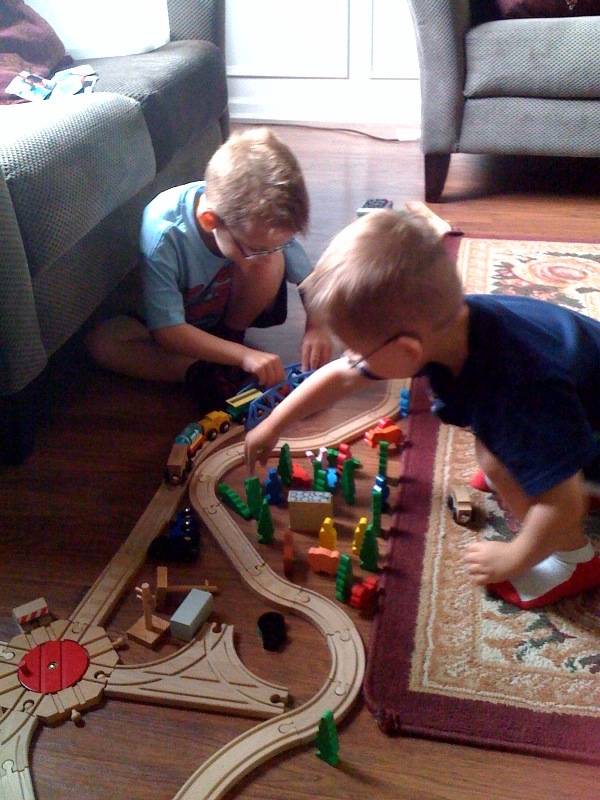 The boys play trains together. This lasts peaceably for a whole five minutes. Mad Dog was working late and to motivate the boys to have good behavior through the evening, I said that we could watch America’s Funniest Home Videos together. Before we headed up to bathtime they went through the rules. No hitting, no biting, no tackling, no splashing, no throwing, no disrespectful talk and at the end of the list they both say, “no nothing (little T.Puzzle says ‘no nuffing’) or you go to bed without a treat or a show”. That’s when I came up with my future book on discipline called ‘The No Nuffing Approach to Making Your Children Behave’. We got through bathtime, treat time and teeth-brushing and ‘snuggled’ up on the couch together. I use the term ‘snuggle’ lightly because I always end up injured. First someone inadvertently elbows me in the rib-cage, then someone else ‘sits’ on my lap with such force, I almost lose my breath and finally, someone always, always drops a hotwheels on my foot (ouch!). It’s a given that my boys will be less than gentle but they are learning. At least now they apologize when they unintentionally inflict pain upon me.